Overflow drain pipe at the rear of the device should be plumbed to nearest drainage. 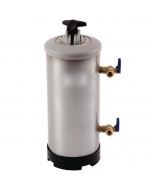 This fully automatic commercial water softener is our easiest to operate unit and is ideal for catering environments. The regeneration process is completed automatically by the unit at pre-set intervals and can be adjusted to occur at any set number of days and times. The device comes pre-programmed with standard timings but can be adjusted depending on machine use. Operators can easily adjust regeneration timings with the manual clock timer control interface. Provides a complete solution to problems caused by limescale build up and hard water, such as flow reduction, equipment damage, heat insulation, high detergent use, and sediment or soap scum build up. This fully automatic catering water softener leaves only soft water, preventing scale buildup, lowering equipment servicing costs, prolonging machine life and improving energy and detergent use.